Don’t own a boat but want to enjoy the picturesque Idaho summer on the water? We’ve got you covered. From pontoons to jet skis to kayaks, there’s something to suit just about everyone. Whether you’re looking to enjoy a thrilling day on the lake or a peaceful paddle on the river, here are the best boat rental places in Idaho. Intermountain Power Sport Rentals services most of the Treasure Valley area, with locations in Nampa, Cascade, and Idaho City. They rent ATVs, dirt bikes, jet skis, snowmobiles, and, of course, boats. Choose between their wide array of ski boats, pontoon boats, and fishing boats. Feel free to call ahead to reserve a rental or make a reservation online. Situated near Lake Coeur d’Alene, Harrison Idaho Water Adventures offers reasonable rates for wake boat, ski boat, pontoon, paddle board, and kayak rentals. Their mission is to be “the one stop shopping experience for boat rentals and water sports on Lake Coeur d’Alene.” They even offer dock delivery. KJ Watersports offers alternative boat rental services on Lake Coeur d’Alene. They primarily stock ski boats, pontoons, and jet skis, with multi-day rental discounts of up to 20 percent off. And if you love your boat too much to let it go, they’ll even sell it to you (or something similar). RBK Power Sports Rentals operates Boat Rentals in Boise and Nampa Boat Rentals. Whether you need an ATV, pop up camper, jet-ski, fishing boat, or Bayliner, they’ve got a great deal for you. Leave them a message on their website to receive a free quote. Red Line Recreational Toys stocks products from Polaris, Kawasaki, Thor, and many more trusted names in recreation. They sell and rent boats, motorhomes, camp trailers, haulers, motorcycles, and snowmobiles. 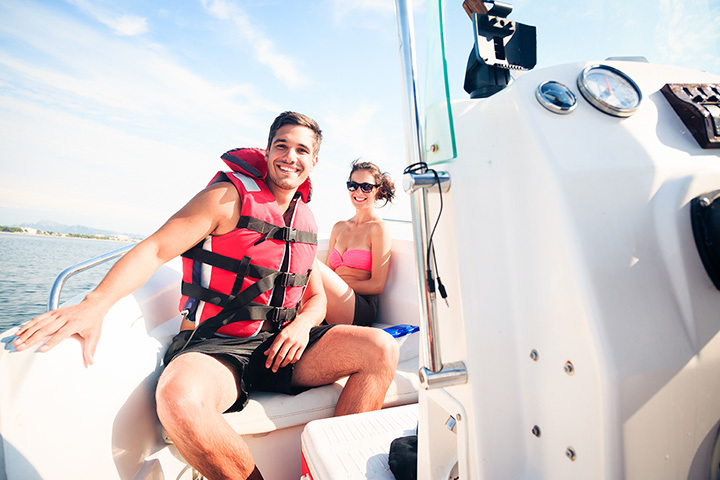 Choose between personal watercraft, wake boats, pontoon boats, and jet boats for your perfect day on the water. Sandpoint Water Sports services “all of Dover, Sandpoint and all of Pend Oreille River but exclusively operates out of the Dover Bar.” Rental options include ski boats, pontoons, and WaveRunners. Can’t get the boat yourself? No problem. Their delivery service will bring it to you. Action Water Sports in Sandpoint, Idaho offers lessons, lake tours, and boat rentals. Available boats include power boats, pontoon boats, paddleboards, kayaks, and jet skis. Book your selection for four hours, eight hours, or 24. Sandpoint Watercraft Rentals in Sagle, Idaho has the goods. They’ve got power boats. They’ve got kayaks. They’ve even got paddleboards and water toys, like water skis, wakeboards, and wake surfers. In other words, if you need a piece of equipment to make your next water adventure worthwhile, Sandpoint Watercraft Rentals is here for you. Backwoods Adventures is known for providing excellent family river adventures as well as boat rentals. Consider trying out their SUP yoga at north beach or giving your child kayak lessons. You can book a canoe or tandem kayak, single kayak, stand up paddle board or kids kayak on their website. White Otter Outdoor Adventure invites you to “join… for your river rafting adventure” in the Stanley area. They’re happy to customize a trip for your family, using their expertise and knowledge of the river to ensure you have a great time. Call or send an email to reserve your spot.